The end of the winter doldrums are in sight in Hendricks County, Indiana, as we enter the month of March. The vernal equinox occurs later this month, and with the arrival of spring comes the promise of warmer weather, lighter jackets, opportunities to work in the yard and garden, and a fresh start to the new year by sprucing up the interior and exterior of your home. As we careen toward the season of rebirth, make plans to head over to Brownsburg for a stop at Frazee Gardens. Frazee Gardens, as you might expect from its name, is a garden center. But it&apos;s also much more than that, offering interior and exterior decor, clothing and local artisan crafts in addition to a wide variety of plants, seeds and other garden needs. It truly provides a unique shopping experience for any visitor or local. The inside of Frazee Gardens is an eclectic experience that features crafts, artwork and decor created by local artisans to provide your home with a splash of color, a conversation piece, a fresh scent or just something new with which to decorate your house. You&apos;ll find a little nook in the store that features cacti and other succulents, along with decorated planters and pots for them. Wall-hangings, throw pillows, blankets and even furniture populate the store to provide a wide variety of ways to bring some pizzazz to your life. An extensive collection of artwork, fountains and yard ornaments caught my eye because each piece blends wood and stone together for a unique look. You might want to grab a cup of joe at the coffee bar within Frazee Gardens as you move on to the areas of the store where you can even give yourself an upgrade. 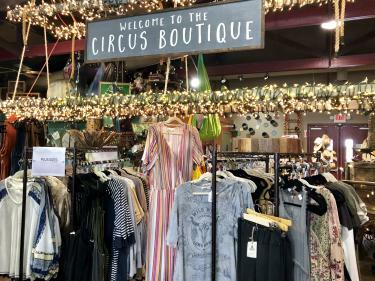 Check out the large selection of clothing in the Circus Boutique and try some new fashion and new colors in your wardrobe. Then wander over to the Local Artisans section, where you can find jewelry, home decor, wall hangings, smell-goods and much more -- all created by hand by locals. On the back wall of the store, shoppers will find feeders for birds and animals, as well as the food necessary to attract critters to your window, adding life, color and entertainment to your world. Frazee Gardens also offers a large enclosed and heated patio, where even more treasures await your discovery. 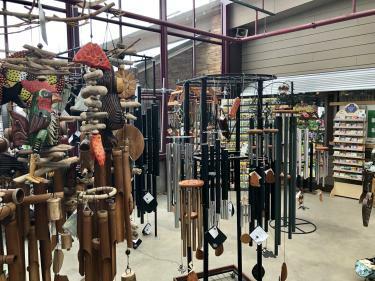 There are fanciful wind chimes, yard ornaments, exterior decor, vegetable and flower seeds, shepherd&apos;s hooks and plants, plants and more plants. They even have any tools and fertilizer you might need to care for the plants in your life. Frazee Gardens has more than 27,000 square feet of greenhouse space where they grow their own annuals, perennials, trees, hanging plants, edibles and more. By the time the weather warms up, thousands upon thousands of plants and trees will be available in the outdoor shopping area, along with mulch, garden rock and all of your other landscaping needs. Got a landscaping job that&apos;s bigger than you can handle? Frazee Gardens can help you with that, too, offering delivery of landscaping materials, plus professional landscape design services and installation. So, shake off the winter blues and get ready to tackle the yard when things turn green by visiting Frazee Gardens in Brownsburg. Open Mon-Fri 9 a.m. to 6 p.m. (closed on Mondays and Tuesdays during the winter); Sat 9 a.m. to 5 p.m.; Sun noon to 4 p.m.